Superman thinks back over the events of the past few days and the death of this world's Superman. He stands over the half finished crypt and is lost in thought, until he realizes Lana Lang is underground breaking into the crypt to keep a promise. Seeing Clark in the shadows Lana immediately assumes it's the Clark of this world and hugs him until she realizes he is the mysterious 'pretender' that was there during the final battle. After initially tearing strips off him for pretending to be Superman she is also taken aback that he knows her name and is strangely familiar. Upon questioning, Clark reveals he has been waiting to see if this world's Superman would return. Lana reveals she made a promise to her friend that she would bury him with his Earth parents. Clark explains how he fought Doomsday, not a virus but a beast and how he fell. He explains to Lana that he returned from certain death with the aid of Kryptonian artifacts which are unfortunately inaccessible to him as far as his original Earth is concerned. Lana begins to access information somehow imparted to her from her Superman, she asks the new Superman if he too had a Fortress of Solitude. Superman points out that though he did he's never visited upon principle that this version of his Fortress wasn't his to visit. Determined to find out if the artifacts exist on this Earth, Lana demands to be taken to the Arctic. Both Lana and Superman are taken aback by how epic a facility it is and set about hunting for the regeneration matrix. The Fortress robots cannot find a single trace of it but while browsing Clark discovers the Crystal Font, the holographic player that uses sunstones to store zettabytes of historical data. The Font recognizes the new Superman as Kryptonian and plays a message from the previous Superman intended for Kara telling her to fulfill her potential. Clark is shocked by what he sees next and is disappointed in himself for never having thought of it. The central statue once had just Superman's biological parents holding up a globe. This Superman however updated the statue to include the Kents. Superman aids Lana by secretly stealing the body and fulfilling his dying wish to be buried with his parents. Lana asks for some alone time to finish the burial in Smallville herself. Clark adds a special memorial addition to the Fortress, a statue of the fallen Superman and realizes he should finally take the mantle of his predecessor and become the one true Superman. Clark is alone at the grave of his 'twin' and he says a sorrowful goodbye now that resurrecting him has proved to be a failure. As he thinks back to Mr. Oz and his prophetic words Clark touches the grave and something strange happens, his handprint leaves a glowing blue remnant, what could it mean? Brushing it off Clark swears to his 'twin' to continue his legacy stating with pride as he rips open his shirt that 'The colors will fly!' Now Superman's attention turns to his family, now all sporting a new last name, 'Smith' and a new home in Hamilton County. Jon, Lois & Clark's son, watches in awe one night as his dad saves their new home, the Smith Farm and its livestock from a fire. A stunning site of heroism... but the next morning Lois & Clark are cleaning up the mess while an excitable Jon is eager to help and explore his burgeoning powers. Clark promises to allow Jon to help if his son keeps his powers in check in public. Jon promises and races eagerly with his cat Goldie to fill up the corn harvester. As the two race through the fields they don't notice that an eagle has been circling them. As it swoops down on Goldie Jon lets his emotions get the better of him and unleashes his heat vision, the result is an explosion of feathers and the horrifying sight of poor Goldie burnt to a crisp. Jon is horrified at what has happened and that he broke his promise to his father, worse still he realizes a young girl had seen the whole thing happen. As he returns home Clark offers to help him explore his powers while rebuilding the barn but is taken aback when his excitable boy turns him down. Over dinner Lois discusses her writing and notices that Goldie hasn't come home. Jon lies that he hasn't seen her and a knock at the door interrupts any further probing. Kathy Branden introduces herself on behalf of her family in the neighboring dairy farm. Bringing over a gift of local produce Kathy politely explains why they hadn't been over to visit before now but then she spies Jon. Lois quizzes her on Goldie and a relieved Jon sighs when Kathy doesn't reveal the truth and leaves. The events clearly weigh heavily upon Jon and when Lois & Clark talk about fitting in and making friends Jon's temper gets the better of him. He hates lies and hates that his mother & father seem to condone them. Clark sends Jon to cool down in his room and the tearful boy sits looking out his window. As the sky darkens two shadowy figures appear on the Smith Farm. Jon recognizes them as Wonder Woman & Batman. As Clark, garbed in his costume steps outside to join them Jon can't resist using his powers to eavesdrop but he isn't stealthy and he's spotted by the superheroes. Jon sits in the dark for a few seconds hoping everything would go away but his door opens and Superman cooly instructs his son that they are leaving to talk. 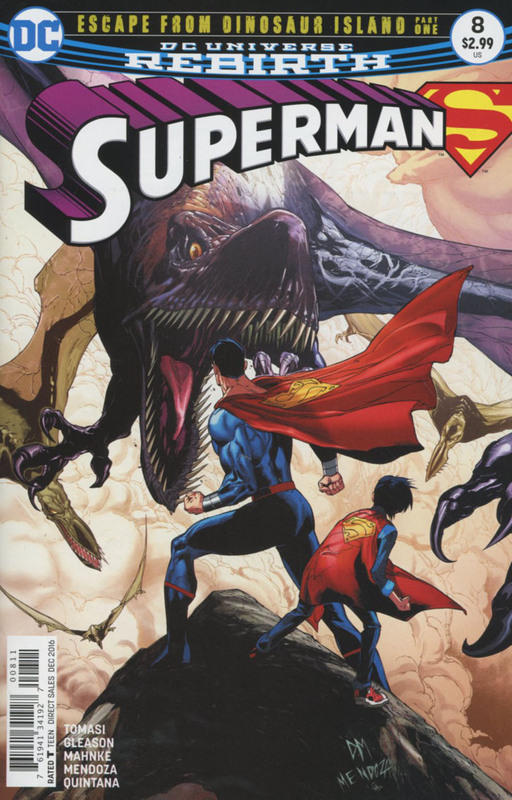 Superman takes his son Jon on a mission to save a submarine, which is being attacked by a giant squid. Superman mentors Jon to use his heat-vision. The creature, which was being mind controlled, escapes to the ocean depths. Jon, whose knee is cut during the save, flies off with his father. His blood, left on the ice, is examined and used by an unknown entity, who uses it to gain access to the Fortress of Solitude. Back home, Jon tells his mother about the death of her cat, while Lois receives a package from this world's Lois Lane. Jon and his new friend Kathy are sitting up in a tree. When the branch breaks Jon falls and is knocked out. Kathy and her grandfather rush him to his parents. 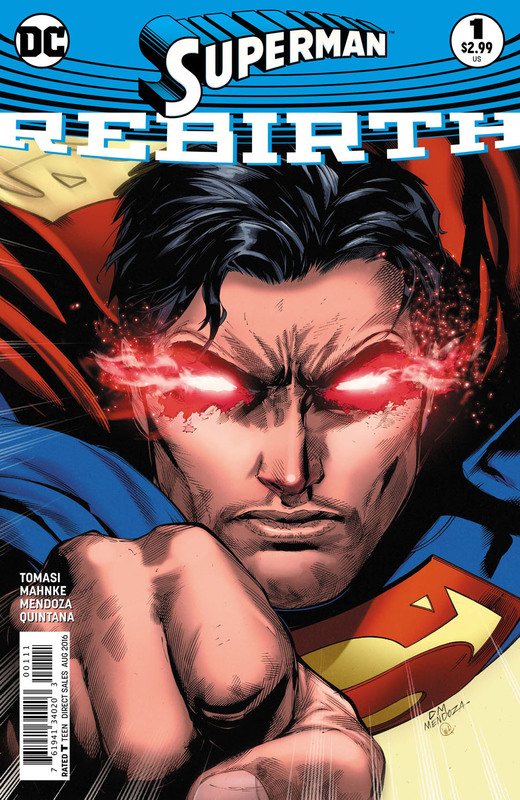 Superman flies him towards the Fortress... but inside the Eradicator awaits! The Mountain Fortress is good, but the fallen Superman's Fortress is far more advanced and so Lois & Clark Smith have brought along their unconscious son Jonathan to discover why his powers are fluctuating. Upon arrival they find the Eradicator facing off against Krypto. Superman is shocked to see a new Kryptonian tech being looking like a twin from his Earth. Clark and the Eradicator fight refusing to listen to each other's dangerous reflection. In the meantime, during the heat of the battle, Jon wakes up and is desperate to help his father fight this menace but as they get more and more aggressive they bring down chunks of sunstone. 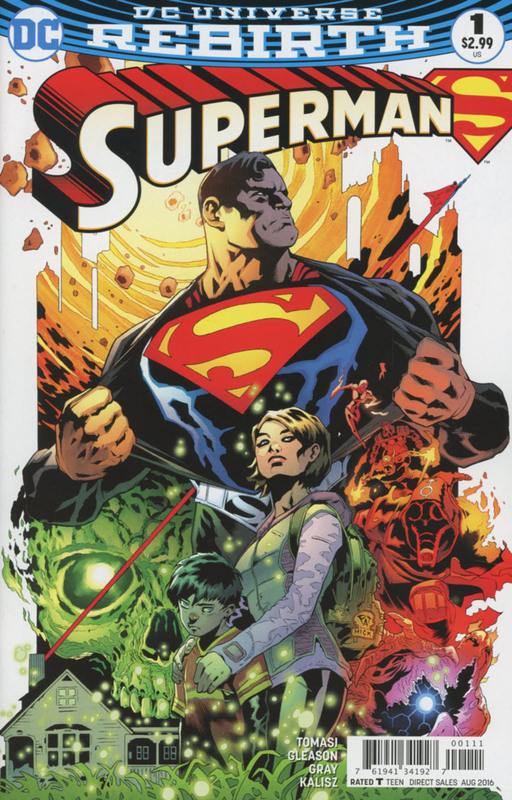 The Eradicator catches the largest chunk of the crystal and looms over Lois and Jon with Clark watching in amazement as his 'foe' tosses the sunstone aside and helps his family to safety. Lois, Jon and Clark are all uneasy as they run scans. The Fortress computers reveal that Jon's body is struggling to adapt to being half human, half alien but offer no solution. 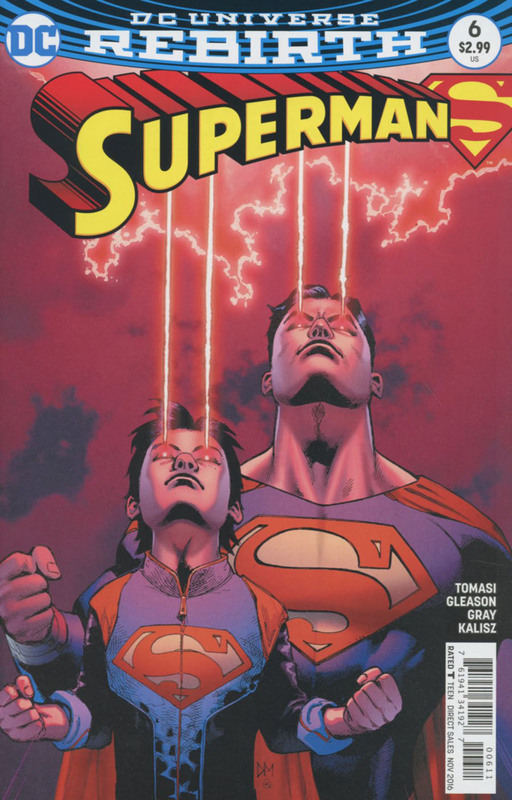 Clark turns his attention to Eradicator and questions why they look similar and both sport the El crest. He reveals he assimilated Clark's belongings to create a human form. He reveals he was one of many Eradicator mechanoid soldiers that were built on Krypton to follow General Zod's will to arrest all Kryptonian lawbreakers by transferring their life-force to the Phantom Zone while their bodies were placed in cryonic stasis. During a mission they were sent off planet but Krypton exploded leaving the army of Eradicators lost and alone. One unit, the one standing before Clark, saw Kal-El's ship escape and their final protocol, find the survivor, was activated and it attempted to follow, albeit slowly. The drop of blood from Jon attracted the Eradicator and he followed them to preserve the Kryptonian genome. Jon is 'tainted' and therefore would not be able to preserve the legacy of Krypton. The Eradicator offers to purge the human DNA to make Jon fully Kryptonian and states he must first ingest Jon to cure him. With Clark forced back by the vacuum, Krypto leaps to defend his family and is ingested in the process. Clark is enraged and beats Eradicator to a pulp while a devastated Jon seeing the death of yet another animal picks up Krypto's cape and his eyes begin to burn with energy. Superman leaps forward separating Lois, Jon and the Eradicator. The fight between Clark and the malfunctioning artifact cause harm to Lois, and Jon swears to break his power vows and kill Eradicator. 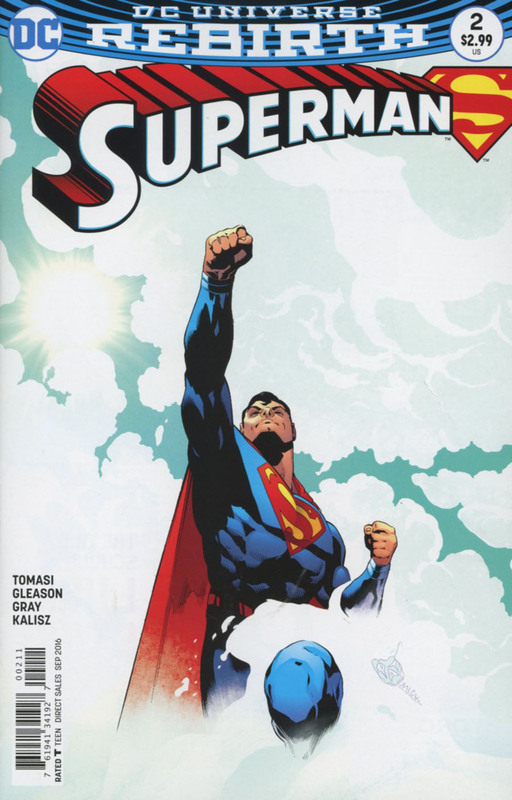 Lois pulls him back and reminds her son he can rise above the anger, he's the best of human and Kryptonian. He can be great if only he'd choose to be. Jon zips up his jacket and heat seals Krypto's cape to it before racing to help his dad. 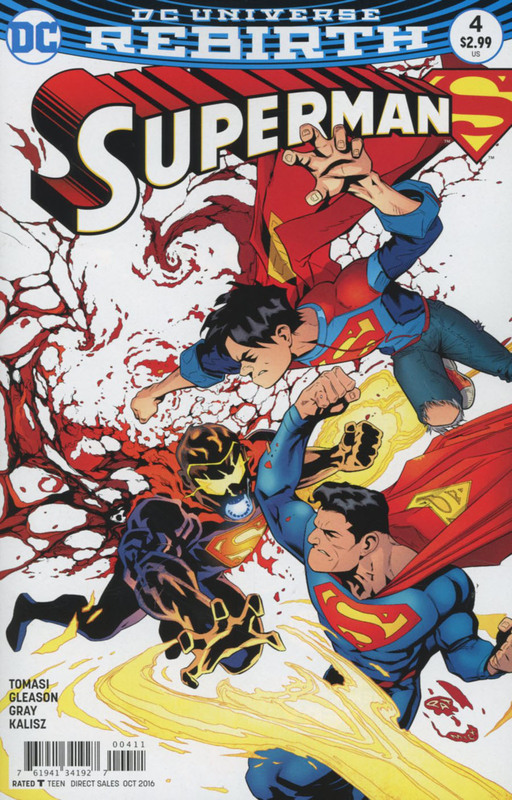 Father and son unleash a powerful punch each, one that literally knocks off Eradicator's head. 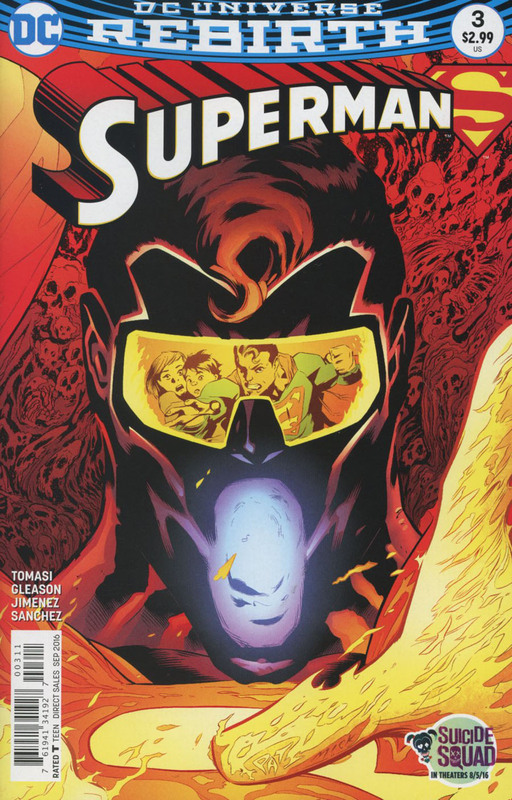 Superman pulls Lois and Jon to safety as Eradicator releases everything trapped within him. Superman realizes everyone on Krypton, his parents, his aunt, his dog, are all still alive but are now being purged from Eradicator's body. The Eradicator swears they are all one and after replacing his head tries to unite everything related to Krypton. Meanwhile in the Ace O' Clubs bar, owner Bo 'Bibbo' Bibbowski and Gotham hitman Hacken are arm wrestling. The prize for the winner, a moon rock, supposedly from Krypton. Naturally, Bibbo wins much to the anger of Hacken and the 'Sooperman' shrine Bibbo has made gains its newest piece of memorabilia. Supernatural energy explodes over Suicide Slum and suddenly everyone from the Fortress has been teleported to the bar, drawn to the piece of space rock. The spirits begin possessing the customers in the bar, in the absence of their real bodies they begin trying to help Eradicator return them to life. Lois sees the rock and realizes it is the reason they've been drawn to Metropolis. With the help of Bibbo they hurl the rock as far from the club as possible. Suddenly with the rock away from them the �ghosts' regain composure and release the humans they'd possessed. 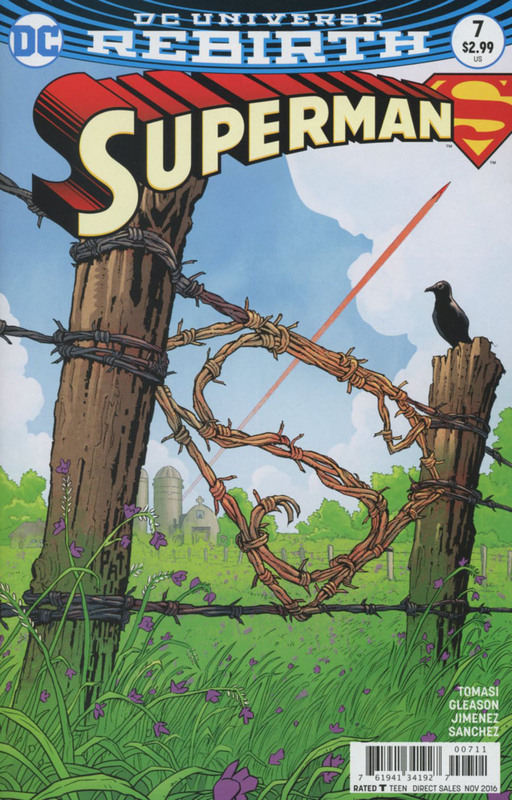 The spirit of Clark's father, Jonathan Kent, appears and helps his son regain his strength and inner peace. Clark is then able to speak to the Kryptonians who tell him they are at peace free from the Eradicator's prison. This peace lasts mere moments as Eradicator appears, fully regenerated and absorbs them all again. He then swears to free Clark's sanity by assimilating his 'half breed' son. Jon gears up for another fight but Clark teaches him another lesson. Learn when to stay and fight, and when to go. 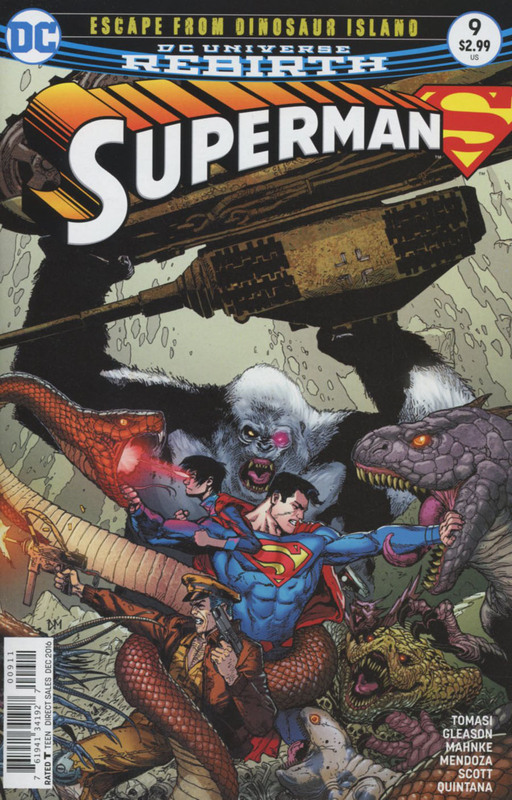 Superman races across the river towards the Metropolis Aquatic Research Laboratory and as he does some of the remaining spirits offer to buy him time by sacrificing themselves. The spirits all charge at Eradicator with such force they knock him back and force him to absorb them. Superman grabs a sub built for trench exploration and races away towards the moon. Hacken snipes that Superman is running away, but a confident Bibbo tells his pal that Sooperman has a plan! 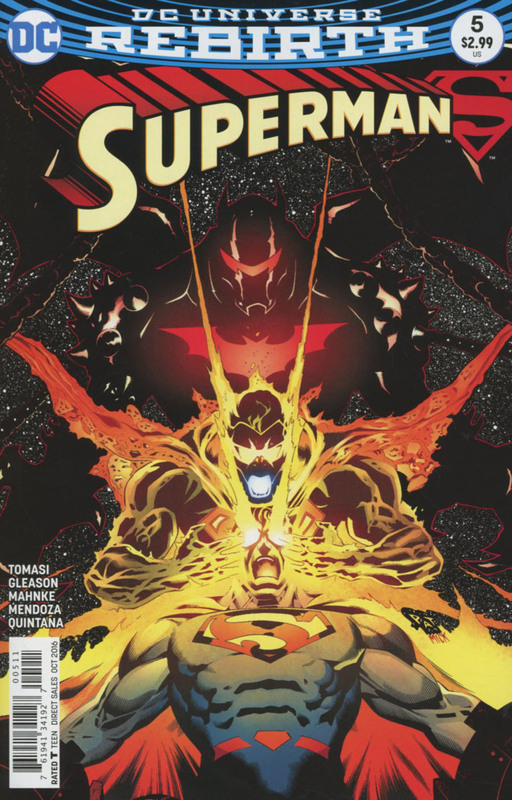 Superman, empowered by the souls of Krypton, fights back against Eradicator while Lois protects Jon in the borrowed Bat armor. The fight gets more and more aggressive bringing sections of the Batcave down and rocking the surface of the moon. The quake draws the attention of NASA and their moon module and as soon as The Eradicator and Superman soar out of the crater the world media soon stream a live feed. Superman and the souls fight the android. One soul, trapped by Eradicator still resides within him and is fueling his fight while all the other souls aid the Man of Steel. Superman realizes who the soul is and with all his strength, physical and will based, he calls out to that soul, the most loyal of dogs... Krypto! With the combined might of both Krypto, Superman and the souls they create a massive ball of energy and soar downwards onto the moon surface. The force is on atomic levels and leaves Eradicator an almost lifeless husk. The souls converge above them, forming the House of El crest before dispersing into the afterlife. Krypto watches over the android's remains while Superman moves the moon module to safety and raises the american flag back to its pride of place on the moon's surface. The epic moment is captured on the live stream and Superman is revealed to the world once more. Superman and Krypto head home, but it isn't the end. Superman returns to Metropolis a hero, the guest of a huge parade and the recipient of the key to the city. Lois and Jon watch with pride on TV at home and Bibbo arrives at the parade to proclaim his friendship with Superman. But questions are raised and later that night Clark visits Jon with two gifts. A Hamilton County Huskers cap and a pair of spectacles to match Clark's. Jon is uneasy at having to keep more secrets and telling more lies, but Clark points out he isn't completely 'super' yet and more threats will rise in the future and to preserve their family, while fighting for truth and justice, this is a small price to pay. Clark has one more surprise, suiting up he and Jon travel to the Justice League Watchtower. There they find Batman angry at the destruction of his cave with Wonder Woman trying to calm him. Superman apologizes and tells Bruce 'we' will repair the damage. Diana is curious as to Clark's wording of 'we' but that is when Jon steps out of the shadows in his new role of SUPERBOY! Clark has helped repair an orbiting satellite and faster than he thought it would take, leaving him time to bond with new friends with familiar faces, namely Barry Allen, Princess Diana, Arthur Curry and Bruce Wayne, aka The Flash, Wonder Woman, Aquaman and Batman. His heroic assistance builds bonds even with Bruce, though he'd be reluctant to admit it. Superman then spends the night watching over Metropolis and his old home away from home, the Daily Planet. With the city keeping him busy Clark realizes he's been caring so much for the world he almost forgot his own world, that of the Smiths and races home to Hamilton County. Lois and Jon remind Clark that it is the last night of the County Fair. To their surprise Clark swears to hang up his cape for the night and be with his family. Lois is skeptical, Jon overjoyed. The family enjoy the fair, a rare moment of relaxation and even though Jon is reluctant to speak to Kathy Branden, Lois nudges the friendship forward promising to watch the Blue Ribbon contest. Meanwhile three local thugs notice the ticket office is cash only and plot to rob it, while the Smiths approach the Hamilton Elementary booth and meet Jon's teacher Mr Martinez. While Jon's teacher sings his praises, the thugs unpack pistols and clown masks. Lois approaches the booth of the local paper The Hamilton Horn and Clark takes Jon to meet Cathy. Clark literally bumps into one of the thugs and is taken aback by the clown's rudeness. His suspicions lead to a quick glimpse with x-ray vision, and super hearing, both of which reveal the robbery plot. But Clark remembers his promise and holds back on a 'Super' intervention. Lois meets up with a snack laden husband and tells him she's organized an interview for Clark to work on a column for the paper. They arrive just in time to see Cobb's cow win first prize and Clark apologizes for being rude when Jon had his head injury. While Kathy and Jon enjoy cotton candy Cobb introduces the Smiths to Doc Brooks, town physician. The new friends toast Cobb's winning and the fireworks display is announced, leading Clark back to watching the criminal clowns. Clark makes an excuse to slip away but dons a medieval costume from the fair rather than his Superman suit and rejoins his wife and son as they are climbing into the rollercoaster. The ticket office staff accidentally turn on their p.a system and describe how a medieval knight with heat vision foiled the clowns robbery and saved the takings. Clark may have kept his promise of no Superman rescues but Lois is unimpressed at his sneaky workaround. Still the thrill of the coaster and the awe of the fireworks serve as a great distraction!